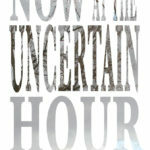 Now at the Uncertain Hour is an intriguing theatrical piece, originally written for live performance, online streaming, and broadcast radio. The show takes the audience on a journey through the landscape of a soldier’s memory as a collector attempts to make sense of what will be left behind. In the midst of the relentless currents of time, what can we take hold of that will go on, that will not be lost? Photographs, scraps of paper, lights in windows, smells of certain fields ground us in place and time but only to the extent that we are awake to them. Ultimately, the play calls us to look, to listen, to speak, to be creators and caretakers of our own and others’ stories. A play by Damon Falke. Originally produced by Square Top Theatre in 2014 and written for live performance, online streaming, and broadcast radio, the show takes the audience on a journey through the landscape of a soldier’s memory as a collector attempts to make sense of what will be left behind. The show asks: in the midst of the relentless currents of time, what can we take hold of that will go on, that will not be lost? Photographs, scraps of paper, lights in windows, smells of certain fields ground us in place and time but only to the instant that we are awake to them. Ultimately, the play calls us to look, to listen, to speak, to be creators and caretakers of our stories.